"Focuses on the physical-chemical origins and structures formed by the association of aqueous, dispersed polysaccharides with related and unrelated chemical species. 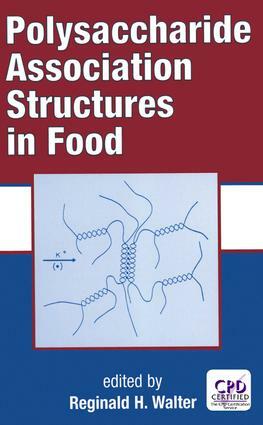 Covers the origin of polysaccharide supramolecular assemblies; polysaccharide molecular structures; gel formation and ultrastructure in food polysaccharides; structures and phase transitions of starch polymers; microcrystalline cellulose technology; cyclodextrins; starch-lipid interactions; interactions in whey protein/polysaccharide mixtures; and more." ". . .an excellent treatment of an important and interesting subject, well written and presented, and with technical content of a very high order. It deserves a place on the bookshelves of professionals involved in basic research, product development and quality assurance, and it would be a most useful reference text for senior tertiary students in food science and technology. Highly recommended. " Origin of polysaccharide supramolecular assemblies; polysaccharide molecular structures; gel formation and ultrastructure in food polysaccharides; structures and phase transitions of starch polymers; microcrystalline cellulose technology; cyclodextrins; starch-lipid interactions; interactions in whey protein/polysaccharide mixtures at pH 7; polysaccharide-metal interactions; rheology of structured polysaccharide food systems - starch and pectin.